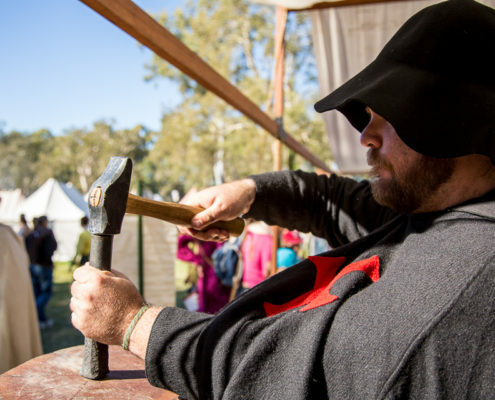 With a village and one of, if not the largest medieval trebuchet in Australia, the high middle age re-enactment groups are ready to put on a show at the 2019 Abbey Medieval Festival. Learn more about these groups and how they represent the High Middle Ages. The Baltic and Eastern European Ritterorden (or, BEER for short), is the 12th century sister-group of the Knights of the Empire Germanica (or, KEG for short). This group portrays the Knights and Germanic people of the ‘Order of the House of St Mary in Jerusalem’, commonly referred to as the Teutonic Order. Members of BEER actively research and portray the early years of the Teutonic Order in the Holy Lands, from their victorious siege of Acre in 1189 through to 1220. Visitors to the Baltic and Eastern European Ritterorden encampment can see a display of the Teutonic Order utilising arms, armour, textiles and furnishings, all carefully crafted as historically accurate as possible, within the constraints of a modern society. Be on the look-out for Teutonic Escorts while wandering the grounds of Abbeystowe! Armoured knights may provide patrons safe passage to their next destination. Blackwolf are a 12th/13th century Crusader group traversing caravan routes. Often in Crusader times, supplies from overseas failed to arrive when needed or if at all, was too little, too late. Blackwolf are Crusaders of different nationalities, using the guise of a Bedouin caravan, in the spirit of Raynald of Châtillon, to make up the shortfall of weapons, supplies and horses needed to continue the Crusader presence in Outremer. Blackwolf will fight for glory on the Castle Arena, but not all Blackwolf are combatants. 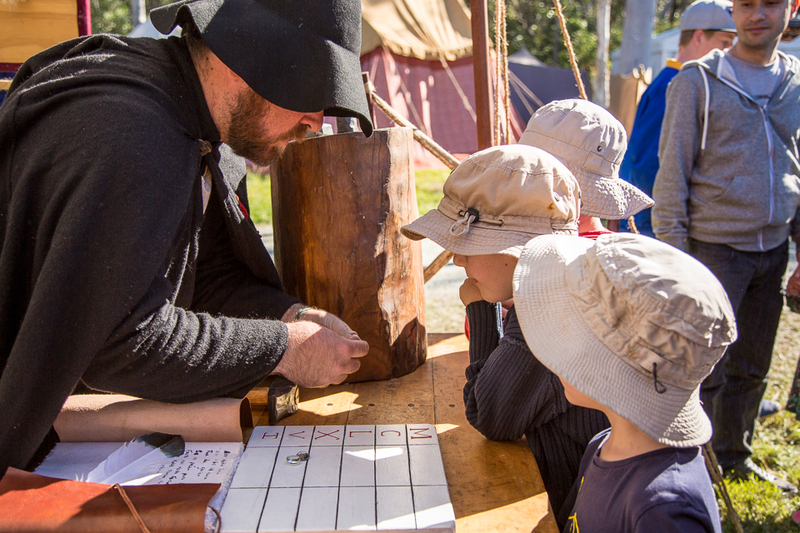 Their encampment is a feast for the senses with crafts, trades and skills such as medieval medicine. Be sure to visit the Blackwolf encampment in St Edith’s Village to learn about the Bedouin coffee ceremony, cheese-making, Bedouin cooking, and linen-making. Check out Blackwolf on Facebook and Instagram to follow them preparing for the Festival, or check out their website for more information. The Companye of Northumbria portrays a crucial period in the development of England, the 12th century, with a focus on the years 1154-1189 during the reign of Henry II. They represent merchants and artisans of diverse backgrounds, the emerging middle class in medieval society at that time, gathered in York during times of fairs and markets, such as the Lammas Fair. Members of the Companye endeavour to recreate as faithfully as possible some of the crafts which would have been on offer during this time such as leadlight and shoe making. Members strive to achieve as much accuracy as possible in their portrayal of twelfth century life by the practical application of the historical methods they have researched. All are warmly welcome to visit their encampment and gain some insight into the work and lives of 12th century artisans. Learn more about Companye of Northumbria. Cottereaux—Company of the Dagger is a mercenary group that portrays life in a siege mercenary company currently in the employ of Emperor Boniface the III. The Company was involved in the sacking of Constantinople and moves where the pay is best. The Company is under the command of Baron Ulric de Tracey and boasts a number of knights, squires and men at arms from various nations across Europe and the Holy Land. 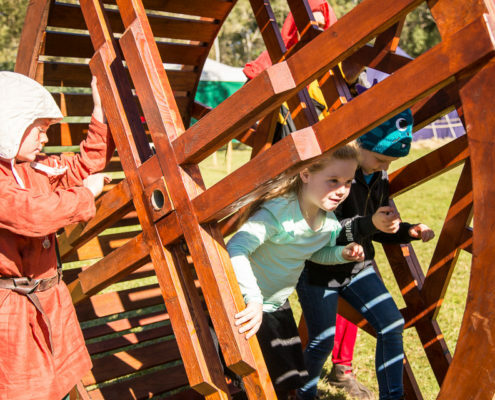 Cottereaux specialise in siege weaponry, they currently own and one of, if not the largest working counterweight trebuchet Australia. They also have 3 medium sized counterweight trebuchets, a traction trebuchet, and a full-size medieval crane. Follow Cottereaux on Facebook to learn more about the group. Oltramar focuses on the lifestyles and culture, equipment and accoutrements of the European nobility who settled on Cyprus in the late twelfth/early thirteenth century CE. During that time Cyprus became a major trading base between the Holy Lands, North Africa and Europe, resulting in a melting pot of European, Byzantine and Islamic culture and goods. The group portrays a family on pilgrimage to Jerusalem, in the year 1229, when the Holy Roman Emperor Frederick II signed a treaty with the Ayyubid Sultan Al-Kamil and restored Christian access to the Holy City and other holy places. 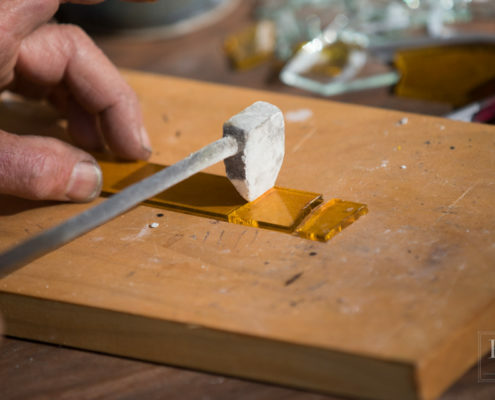 Oltramar pays particular attention to maintaining a high standard of equipment and knowledge through intensive research and reconstruction. Most of their clothing and equipment has been handmade by their members and, as far as possible, all items are as historically accurate as we can make them thereby making the group’s public displays instructive and stimulating. 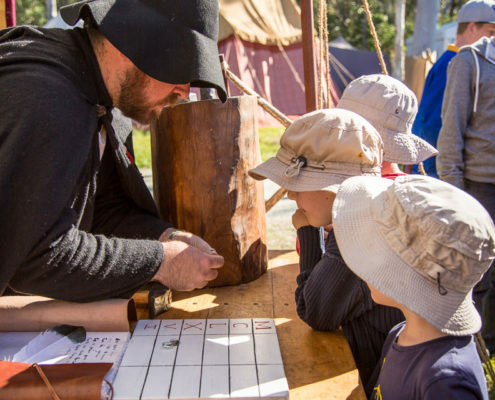 Visitors to the Oltramar encampment can enjoy a hands-on educational and enjoyable experience through practical reconstructions and displays of equipment and skills. 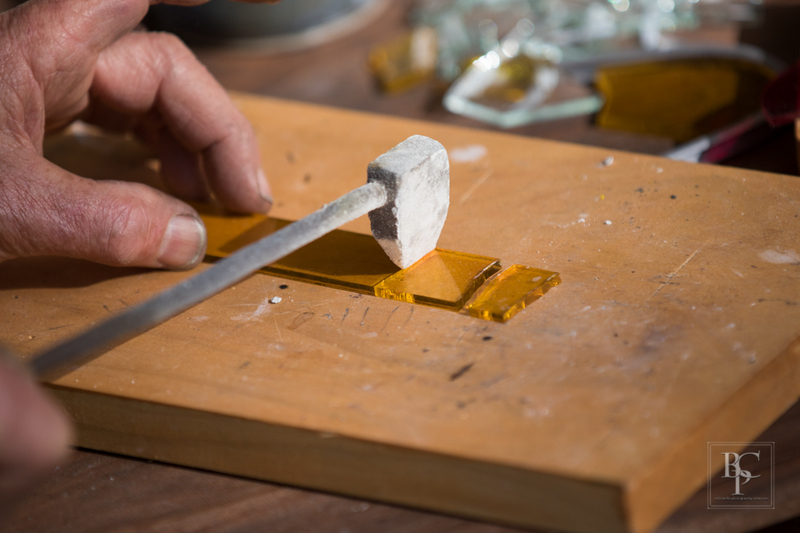 Follow Oltramar on Facebook as they share their research and works. 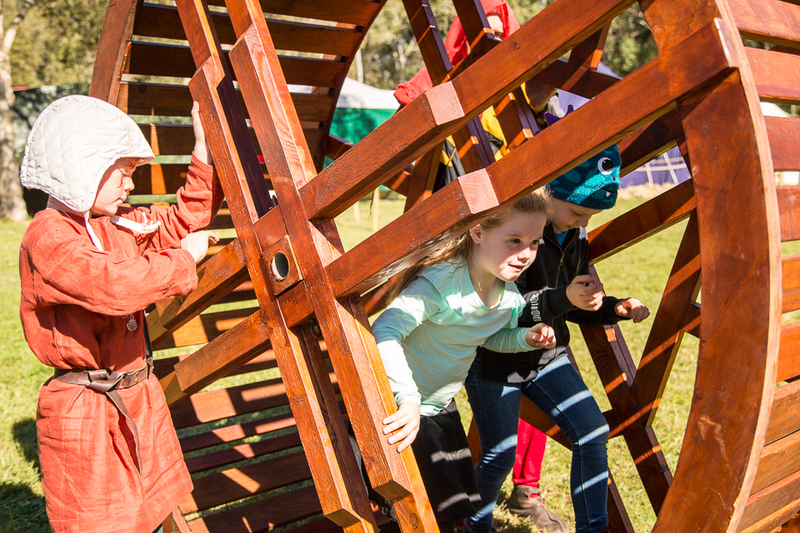 Order of the Golden Wheel is about people and personalities of the past. 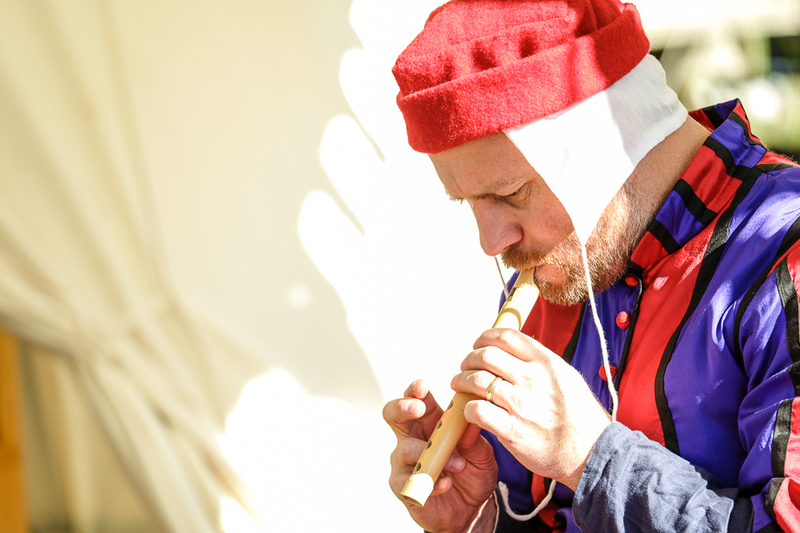 They seek to research, understand and recreate aspects of Medieval life in the 13th century. Their regional interest is in the Mediterranean and the cities and countries on her shores. Specifically, the group focuses on Acre in the year 1250. The diverse city of holy military orders, Italian merchants, crusaders, musicians, traders, pilgrims, rogues all living together. 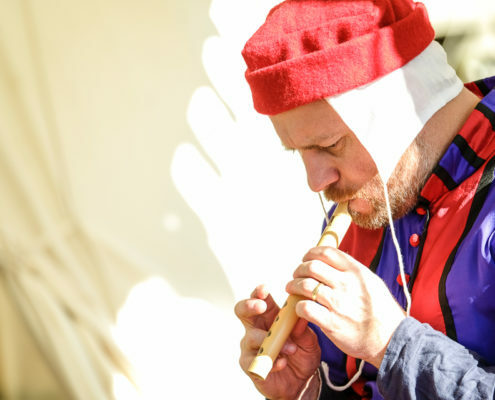 Order of the Golden Wheel perform music and singing throughout the Abbey Medieval Festival, instruments include rebec, drums, friscalettu and the recorder, they will display woodworking activities, calligraphy and map making. Order of the Horse was founded in the year of the horse. Order of the Horse re-enacts many periods of history, but for the Abbey Medieval Festival, they portray elite members of knights, soldiers, nobles and mercenaries of mixed origins portraying the 2nd – 6th Crusades of the late 12th to early 13th centuries. Riders and horses of Order of the Horse are specially trained in mounted and food combat. They can be seen in full display on Sunday at the Castle Arena for their Battle of Hattin—The Fight for the Real Kingdom of Heaven. When members of Order of the Horse are not taking to the Castle Arena in mounted combat, patrons can visit their encampment in the St Edith’s Village where they deliver talks and presentations on combat tactics. Learn more about Order of the Horse by following them on Facebook, or visiting their website. The year the Knights Templar re-enact is 1229. With the re-establishment of Jerusalem as a Christian holding, pilgrims have again begun to arrive in great numbers requiring the Templars to devote greater resources to the task. The group represents the Templar Knights and Clergy who were assigned the task of escorting pilgrims from the coast to Jerusalem and the Holy sites in the Jordan Valley, as well as the nobles and wealthy merchants who sought their protection. These knights were based at Chateau Pelerin, just south of Haifa as shown in the map of the Holy Land. The encampment represents the daily life of Templars away from their permanent bases. 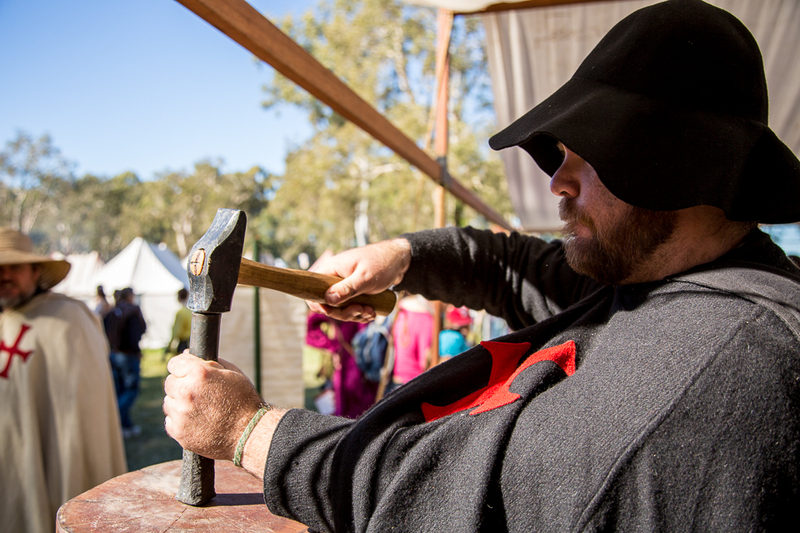 The camp activities reflect the tasks, duties and devotions of Templar Knights engaged in the protection of pilgrims. The camp contains the Brother Knights, Sergeants, Brothers and Priests as well as the Pilgrims themselves. At all times whilst in the public eye, members of “The Templars” shall observe and abide by “The Rule of the Temple”. Follow The Knights Templar on Facebook, or visit their website for more information.